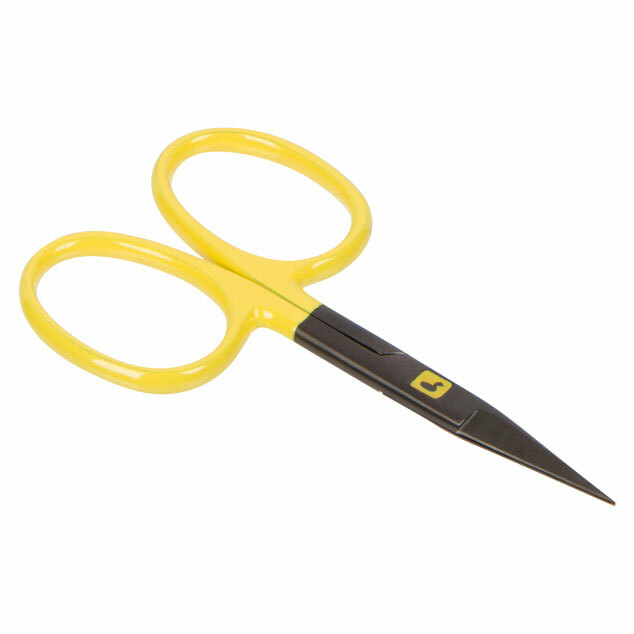 Loon ‘s Ergo All Purpose Scissors with enlarged finger/thumb holes. Fly tying tools haven’t changed in any significant way in several decades. LOON has invested much thought in how to improve these highly particular craft items and has come up with a winning product line. My first impression of LOON’s new tying tools was how sturdy they felt. The ergonomic powder-coated grips feel comfortable in hand, and they’re easy to spot in a brightly colored mess of fur and feathers. A few key improvements are the increased bobbin weights, which help considerably in holding materials in place. Also, the wide-diameter tube makes changing threads quicker and easier, and the well-polished tip reduces thread fraying. The Gator Grip dubbing spinner has some great features: the shepherd’s hook and clamp can be easily swapped, and the octagonal shape prevents it from rolling around on the tying desk. It also prevents thread loops from spinning as you prepare materials to be spun. Clearly, these are tools designed by fly tiers for fly tiers. Ergo Arrow Point and All Purpose Scissors are all you could ask for: comfortable, razor-sharp and precise for the closest cuts. The end result is increased efficiency and tying control, as well as reduced hand and finger fatigue/cramping during lengthy stints at the tying bench. This is a new generation of tools worthy of anyone’s tying bench. Orvis’ 2018 Ultralight Fly Fishing Vest is radical new design that merges high-volume storage capacity with close-fitting construction. The low-profile design keeps load closer to the body and the overall design reduces the “layered bulk” of conventional vests. Even with pockets fully loaded (see below for long list of carrying specs), the vest’s overall flat form cheats wind and remains snag-resistant. 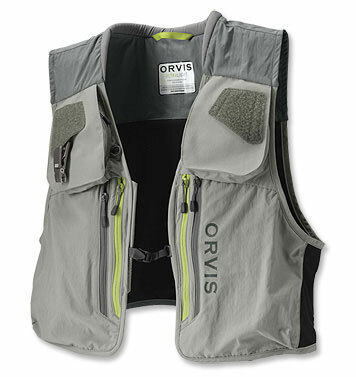 The Orvis Ultralight Fishing Vest offers lots of storage options in a sleek, functional package. Features include: net holder, eleven pockets (6 exterior, 4 interior, and 1 rear), four large vertical chest pockets for fly boxes, two of which have internal stretch mesh organization pockets, and two exterior vertical chest pockets higher on the shoulder for leaders, tippet and other accessories. Additionally, two interior vertical chest pockets hold valuables and the right pocket has a key clip. An adjustable sliding clip closure allows you to adjust vertically to the most comfortable position. Two fly patches hide a port for a zinger and there are two elastic cords on the exterior of chest pockets for adding accessories and a tippet bar. A large rear zipper pocket securely holds extra gear. The design also allows nippers to nest under a fly patch for quick but out-of-the-way access. Forceps can be slid up from the outside underneath Velcro for easy access. The entire package is treated with DWR. For anyone averse to donning a vest, note that this is an ultra-modernized version of an old essential that deserves a close look. Lightweight, hi-capacity, form fitting and breathability make this one of the year’s stand-out wearables. 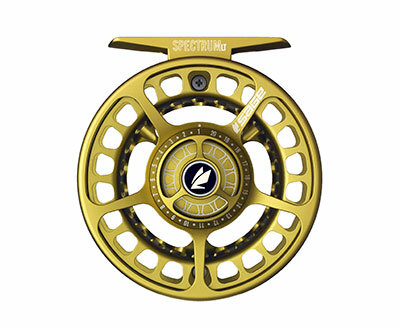 Sage Spectrum LT Reels incorporate a high-performance drag system into an ultra-light frame. Sage’s new Spectrum LT reel has merged advanced drag technology with a truly feather-light package. This is very possibly the lightest reel I’ve ever fished. The reel features an ultra-light, rigid frame and a one revolution drag knob that allows for quick and precise drag settings. With an exterior design that sports clean lines and an equally streamlined no-fuss drag that rinses out in record time, the Sage Spectrum LT is an excellent choice for anyone looking to match a lightweight fly rod with a modern, no-fuss reel. I fished the smallest model and found the spool/arbor design assisted significantly with line stacking during quick retrievals. Particularly noteworthy are the SCS drag systems, which are individually tuned to match the fishing application of each reel in the line (four models in all, covering line weights 3 to 10). If you’re targeting lighter fare but insist on a prudent level of braking capacity for insurance, the Spectrum LT deserves a thorough look. 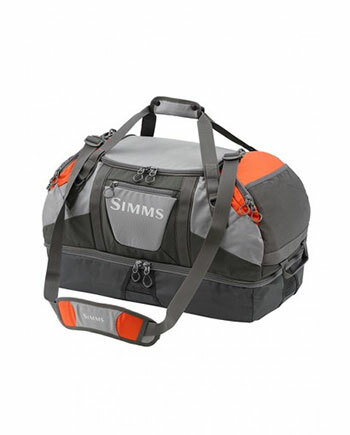 If you’re one who appreciates streamlined, no-fuss travel gear, the SIMMS Headwaters Gear Bag is a straightforward, large bag that allows you to organize wet and dry gear for your commute to and from the water. This generous 90-liter bag includes a wet storage compartment that is perfectly suited for waders and boots, plus a dedicated dry storage zone to keep extra layers and fresh clothes ready to wear. A variety of organizational pockets and an exterior rod tube holder keep your hardware organized for easy access. Waterproof TPU bottom and nylon DWR coated fabrics team up to withstand the rigors of full a fishing day. Tested on several outings, this bag stood up to and performed as well as ones priced in the premium category. An excellent value.